When playing the Baby Hazel Dental Care game the player will learn all there is about the process attending the dentist for a basic checkup, visualized in a virtual makeup so the player and interactively respond and participate instructively. Exploring the wide variety of apertures in teeth brushing etiquette, while learning various rules to follow -such as not eating anything after brushing your teeth before you go to bed- and certain techniques to understand and keep in mind when at the local dentist’s office. 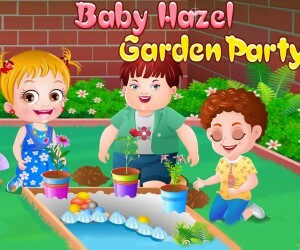 Baby Hazel games are played as an outside party, a third person that helps our protagonist throughout her evening while learning her lesson about when to have candy during the day, and also teaching the player important facts about specific materials to use while brushing one’s teeth (i.e. softer toothbrushes, and less fluid toothpaste). While playing the game, the player will be conducted during his/her performance through a meter at the top left of the screen judging your amount of “happiness” that you have given in helping Baby Hazel through her day. This is the score of the game, and totals out at the ending showing your score. The goal of the game is to help Baby Hazel though the duration of the five levels by keeping her happy throughout in a timely manner -in a literal sense, the game is timed and the faster you make Baby Hazel happier, the better you will do; the time meter is located right above the “happiness” score meter at the top left of the screen. Not only does this game help the players develop important skills, it also teaches them what to do (and what not to) in their daily lives. By applying in real life the skills learned from this online game it can help young kids in their everyday lives. It is time for Baby Hazel to go for a dental check up and learn all about oral hygiene. Yes, it is because of the sweet candies she ate all the time. She has a severe toothache which needs treatment. As her mom is not at home, Baby Hazel needs someone help to go to Dentist. Can you be the one to help her? Quickly take her to the clinic for a checkup and listen to dentist’s advice carefully. Bring her back home and handover her to mom.